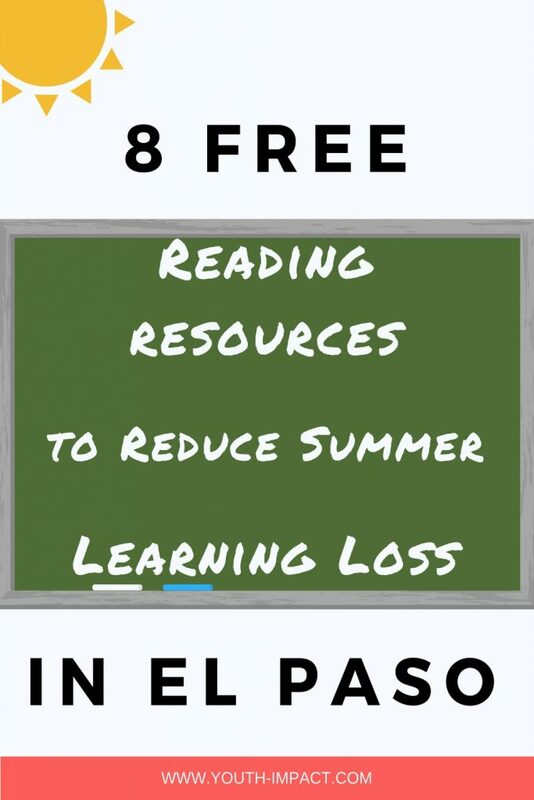 Summer is here for most El Paso students and what a better time than Summer to have fun in the sun and enjoy time off from school. But what about everything already accomplished by your child during school? As parents, we don’t want everything they’ve learned to go to waste once Summer comes along. Did you know that low-income students generally lose about 2-3 months of reading achievement? According to Wikipedia, this is called Summer Learning Loss or others call this the Summer Slide. It is defined as the loss of academic skills during the Summer vacation. Being in El Paso, there is a great learning gap between those families that have a higher income than those with low-income. Those with low income can find it difficult to provide resources for their kids such as purchasing reading materials, taking them on vacation, or enrolling their kids in Summer Camps. This in return possesses a major risk of having a Summer Slide or learning gap for their children. 1) Barnes and Noble’s Summer Reading for Kids requires kids to read any eight books and record them in their Summer Reading Journal (English or Español). They then turn it in and receive a free book from their list of books. You can also visit a B&N and read books out loud to your child in their reading nooks and spaces without having to purchase the books. This will be a short field trip for your children and at the same time an educational moment. 2) Books are Gems Summer Reading Challenge. Pick up your summer reading packet on “Reading Superhero Day!” Saturday, June 10th at 10:30 a.m. This is open to all children grades 1st through 6th. They also offer story time for children who attend in different occasions plus they offer free books each month for both adults and kids. Check their website for more information. 3) Pizza Hut Book It! Program. They offer printables to work on various activities such as alphabet coloring pages, fine motor skills, number coloring pages, plus more. 4) Chuck E Cheese’s Rewards Calendar offers different activities children can do to get rewarded. One of those calendars is the Reading Rewards Calendar which is in English and Spanish. Once your child fills it out, they can earn 10 tokens. 5) El Paso Public Library has different activities and certain book readings/storytimes in the different public libraries in El Paso. Visit their website for more information. 6) If you have Facebook, you can visit and Like Free Parenting and Children Books for Parents, Teachers and Authors Facebook Page. Different authors and parents share free books available through Amazon where you can download the book free on your Kindle reader. 7) Another great website that you can get FREE printables off of is Box of Ideas, by Rodrigo Macias. He offers many educational printables and activities for you to try with your kids. Some of the printables he offers are flashcards, posters and coloring pages. If you have a printer, you can print off these pages at no cost to you but with a great benefit to your children. 8) Teachers Pay Teachers is also another great website that offers some paid and some FREE printables you can use with your kids. There is a vast variety of activities and subjects you can download and print. You can download anything from math activities, posters, reading activities plus more. To help your youth avoid from having a learning loss during the Summer, become involved in their learning and offer them resources that will help improve or maintain their knowledge already gained during a school year. By becoming involved in their learning, not only are you becoming involved but you’re also demonstrating that you care about their success, and in return, you will enhance their academic achievement and potential. Let’s have fun in the sun but also maintain that learning environment at home with some free resources available to you and your children. If you have other resources you would like for us to add, please post a comment below.